December 2013, issue number 2013-12. ISSN 1076-500X. The mini-AIR distribution list now resides on a new machine. The machine it lived on for the past eon is disintegrating. Apologies if there are glitches with this, the first issue spouting from the new machine! ALSO: This is the first issue of mini-AIR in which we are including an image. Having advanced into the the 20th century, we contemplate sneaking some day into the 21st. Dramatic Improbable Research, read by aloud by notable persons. The special Ig Nobel issue (vol. 19, no. 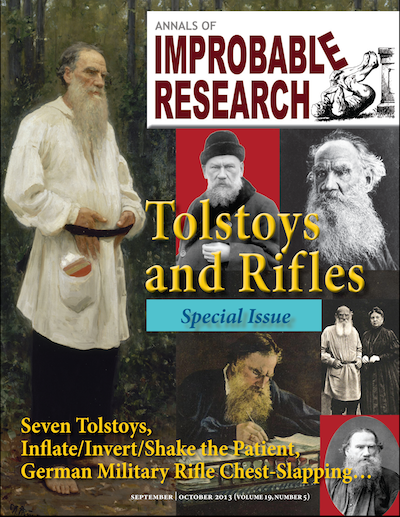 6) of the Annals of Improbable Research is at the printer! The paper version will soon be mailed to subcribers. The e-book version (with identical content) will be in e-bookstores within a few weeks. "Physicists and laymen alike are familiar with the loud crackling noise produced when a crumpled cellophane candy wrapper is unwrapped. This noise is a generic product of thin, crumpled elastic sheets and is qualitatively different from the sounds that can be produced with a flat sheet. Despite its ubiquity and accessibility, to our knowledge there has been no experimental investigation of this sound.... Using high-resolution digital recordings, we study the crackling sound emitted from crumpled sheets of mylar as they are strained." "This model predicts the frequency distributions of first names over the past century (Hahn & Bentley 2003), decorations on prehistoric pottery (Neiman 1995; Bentley & Shennan 2003) and journal citations of scientific authors (Simkin & Roychowdhury 2003).... In some cases, however, there are dramatic fluctuations in the popularities of individual breeds that do not fit this simple null hypothesis. For example, after the release of the 1985 version of the Disney movie 101 Dalmatians, new Dalmatian registrations increased 6.2-fold, from 6880 registrations in 1985 to 42 816 registrations in 1993, followed by a precipitous fall to 4652 registrations 6 years later." So you'd better not sit right beside it. Makes sounds that don't sound like they should. The uvula makes it sound good. "Global drifter array of ~1250 drifters requires deployment of ~1000 drifters per year. When planning these deployments, it�s valuable to have an accurate assessment of where drifters are likely to die."